When it comes to fighting poaching, Nepal's park rangers mean business. Working with communities, the army, police and other key institutions, they have made 2011 a Zero Poaching year as not a single rhino was poached in Nepal during the year – the first time in 29 years. 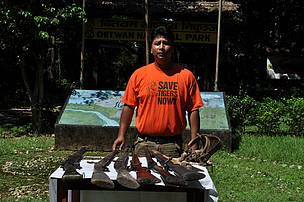 In Chitwan National Park, the strong ranger commitments, community-based programmes and coordinated efforts of enforcement agencies, have also led to Zero Poaching of tigers in the same year. After celebrating World Ranger Day on July 31, we still feel that our rangers could be appreciated more for all the contributions they have made. This is where you can help. You can make them feel appreciated through a simple action-by sending them postcards with messages encouraging them for their braveness and recognizing them for their endurance and hard work in protecting Nepal’s iconic species. 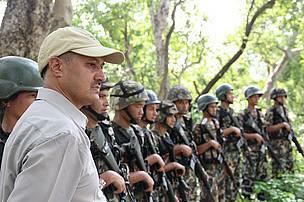 Ramesh Thapa, Bardia National Park's ranger in a mission.